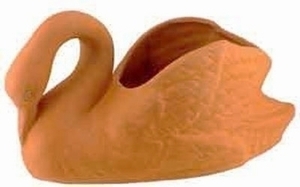 A garden pot shaped like a swan. Made of real clay flowerpot. Our elegant terracotta swan flowerpot is a best seller. Perfect next to a pond or swimming pool this little clay garden pot is beautiful and functional. The swan planter has a graceful neck that is tucked in with its large wings, creating a cavity to fill with colorful flowers or lush green houseplants. Perfect for centerpieces at a wedding or filled with fun items and given as a gift these garden planters are great to play with and fun to plant. When you add a small detail to your landscape decors like one of our terracotta animal planters you will create a lovely yet playful touch to any table, coffee table or a garden patch.